Around three-quarters of all menopausal women suffer from night sweats. Due largely to the negative impact they can have on a woman's sleeping pattern, night sweats are considered as one of the most disruptive symptoms of menopause. So, how do you deal with night sweats? For many, sage is key to alleviating night sweats and other menopausal symptoms. 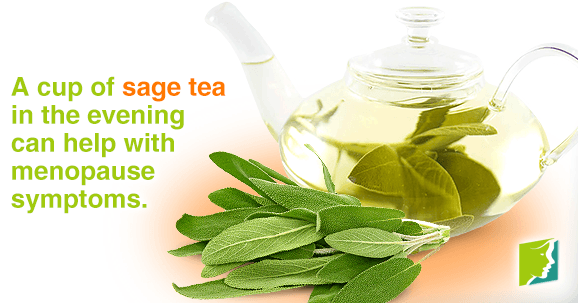 How Does Sage Alleviate Night Sweats? Sage (Salvia officinalis), honored member of the mint family, has a history of medicinal and culinary service that dates back thousands of years. Modern day research into the herb's properties has exposed what our predecessors knew all along: that the estrogenic properties of sage help to relieve the frequency and severity of menopause symptoms such as night sweats, hot flashes, and dizziness. While some of its mechanisms elude scientists, sage's estrogenic compound is proven to be highly effective when used to regulate hormone imbalance. The advantages of sage's compound have also been used to treat irregular periods and to ease the body through periods of hormonal change. Sage makes an excellent natural remedy when used to counteract night sweats, because in addition to reducing sweating, the herb produces a relaxing, tranquilizing effect that guarantees the drinker a more restful night's sleep. Amazingly, sage's benefits extend even further: The herb also acts as an; astringent, antiseptic, stomachic, and tonic. It is beneficial therefore when used to soothe scratchy throats, cure canker sores and tender gums, treat asthma, relieve painful bites and stings, clear mucous, and encourage proper digestion. Just like with any herb or medicine, sage comes with some potential risks. Though considered safe by the U.S. Food and Drug Administration, consuming sage in large doses could result in restlessness, wheezing, vomiting, vertigo, rapid heart rate, tremors, seizures, and kidney damage. It can also irritate the skin of those sensitive to sage. To avoid the risk of adverse side effects, it is best to only consume the recommended dose of sage. When used as an essential oil, dosage should not exceed 12 drops per day. Sage's anti-sweating and relaxation properties leave it an ideal herbal supplement for managing night sweats. To learn more about night sweats, click on the link below. Chevallier, A. (1996). DK Natural Health Encyclopedia of Herbal Medicine. London: Dorling Kindersley Limited, pp. 131. I Don't Have a Fever, Why Do I Have Night Sweats? Read on to learn how increasing your intake of certain fruits and veggies could help keep night sweating episodes away. How Can Drinking Water Help Prevent Night Sweats? Keep reading to discover how drinking more water could moderate internal body temperature to help prevent night sweating episodes. Learn simple habits that will keep night sweat symptoms, such as fatigue, irritability, and body odor, away.